Jackson, 6, shared a touching goodbye with his little sister Addy as the ailing 4-year-old lay dying of cancer. His dad Matt Sooter posted a heartbreaking picture of the exchange on Facebook, writing that life for the pair of siblings should have been much different. “A little boy should not have to say goodbye to his partner in crime, his play mate, his best friend, his little sister,” he wrote. “This isn’t how it’s supposed to be. The little girl’s battle with cancer started back in October 2016, Sooter told PEOPLE Magazine, when he noticed her walking “funny” when they were at the Silver Dollar City theme park in Missouri. He said that the problem “got worse” over the next couple of weeks, and they eventually took Addy to a doctor. The then-2-year-old was diagnosed with Diffuse Intrinistc Pontine Glioma (DPIG) and given just months more to live, PEOPLE Magazine reported. According to St. Jude, there is “no cure” for DIPG and the chance of survival is “very low.” The cancer starts in the brain stem, which controls a person’s muscles, nerves, heart rate and breathing. At first, there was hope. Doctors gave the girl 33 chemotherapy treatments, which helped keep the tumor from growing for about a half of a year, Yahoo reported. But her tumor began to grow by July, so her family sought out experimental treatment in Mexico. The girl’s parents spent over $200,000 for transportation and medical treatments in the city of Monterrey, they told PEOPLE Magazine. The treatment, a shunt procedure to drain fluid from the brain, worked at first — but the Sooter family learned in May that Addy’s tumor continued to spread, according to Yahoo. With no other options left, Sooter posted a sad update on the Hope for Addy Joy Facebook page, where he had been updating followers on his little girl’s fight against cancer. Addy passed away on June 3, according to Fox5. Her family held a funeral for the girl over the weekend. But before she passed, Sooter shared the tear-jerking scene when his son rested his hand on Addy’s forehead in some of her last moments on Earth. 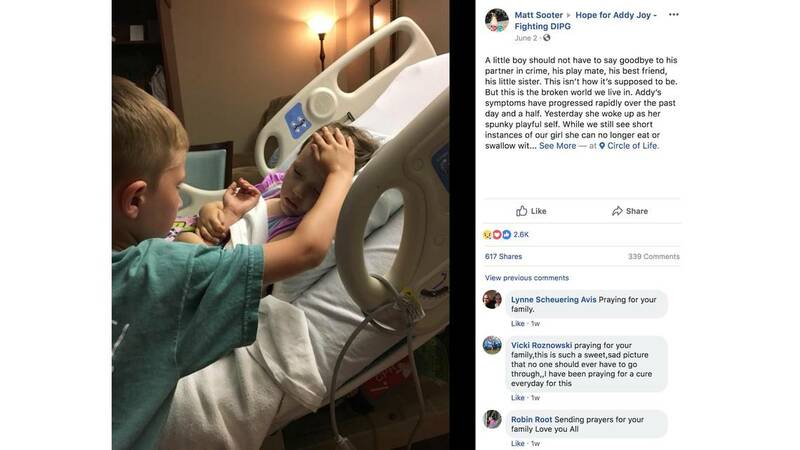 Dad Matt Sooter shared an image on Facebook of his son saying goodbye to his dying little sister, Addy, who was diagnosed with brain cancer in November 2016. She died on June 3 from Diffuse-Intrinsic-Pontene-Glioma.